The aim was to find the fifth gate of the old city – Nigambodh Gate. 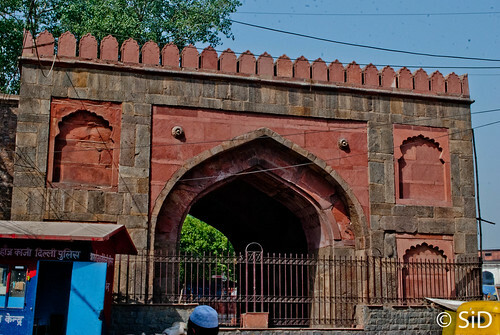 The first four gates – Kashmiri, Delhi, Ajmeri and Turkman were easier to find. For Nigambodh, I studied the pre-1857 Delhi Maps and tried to figure out where the gate would be today. It’s easy theoretically but after searching around I could not find the actual gate. I may be wrong but there is not gate at all. What is left are two walls and the road that divides them. This is probably the same road that led out of Shahjanabad eastwards onto the boat of bridges over the river Yamuna and further ahead to Meerut. Presently it leads to the Ring road that too under a flyover. Turn right after emerging out of the city and you are walking where Yamuna used to flow once. There are 2 bridges over the ring road. One which was built much later is for the trains coming out of old Delhi railway station. The other one is the one which originally connects Red fort to Salimgarh Fort. In the old photos of Delhi, one can see a branch of Yamuna flowing under this bridge where today the flow now consists of a stream of cars and buses. Red Fort – the Prajja Point of view. 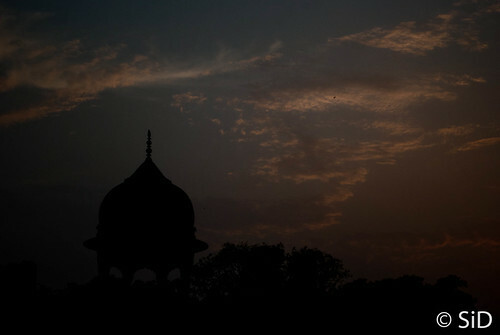 If you visit the red fort, you get to be a Mughal emperor in your imagination. Come out to the ring road and you get to see what the residents of Delhi saw. The king used to come out on the terrace and wave at the audience every day. It is said that if he missed out on this ritual, it used to create an anxiety among the populace and set rumors about his health or being getting overthrown. There is nothing red about this view of red fort as you see the personal chambers of the king in pure marble white. 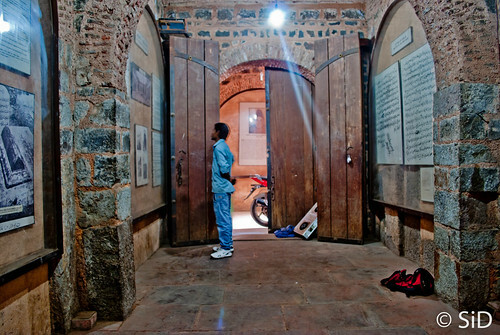 The Gumshuda Talash Kendra of Daryaganj’s nayi kotwali is a historical place in itself for the Doordarshan generation. Walking on the ring road, turn to the right on reaching the Southern wall of the red fort. A few meters of walk brings you to this piece of modern history. The royal mosque which was built by wife of Mughal king, Ahmad Shah in 1751 had domes gilded with copper giving it the name. 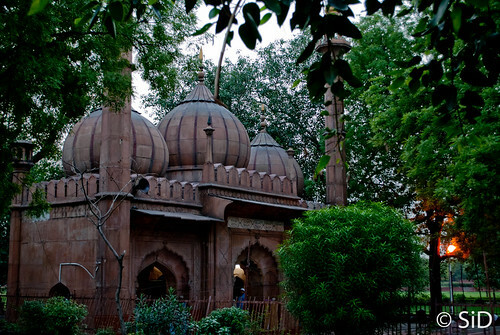 Later they were repaired and replaced with Sandstone by Bahadur Shah Zafar – the last Mughal. The mosque, fortunately survived the onslaught of soldiers and the British. 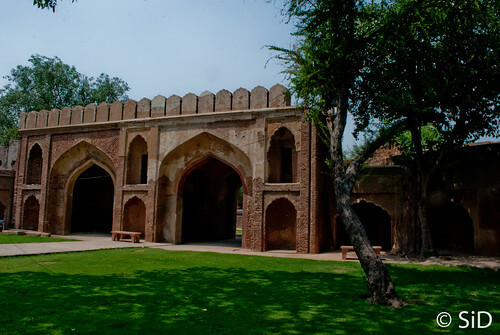 Turn right from the Sunheri Masjid and you are back facing the Lahore Gate of the Red Fort. 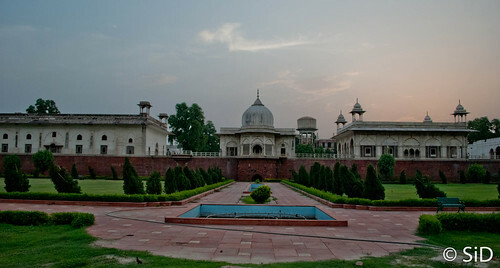 Today’s Purani Dilli or Shahajanabad – the city built by Shah Jahan was a walled city. To get out of this city, there were many gates around the walls. 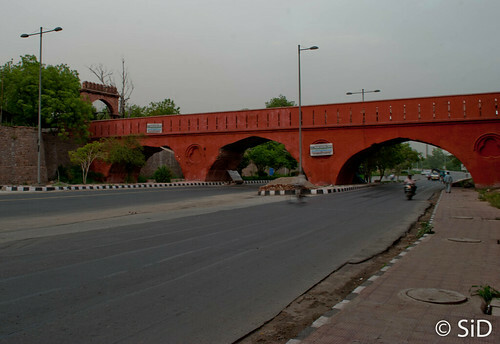 The one to the north was known as Kashmiri Gate. 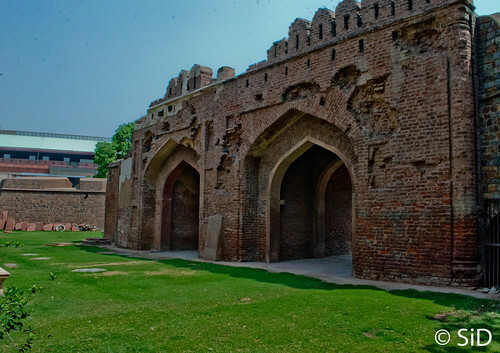 The southern – Delhi gate, the eastern – Lahori gate and so on. During the 1857 uprising, the sepoys closed the gates and barricaded themselves behind these walls. So when the British put down the rising, they did the same to the walls too. Along with these came down these gates. 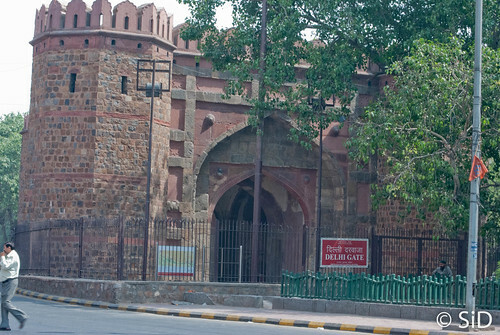 These gates still remain in our vocabulary (Ajmeri Gate, Kashmiri Gate, Delhi Gate, Mori Gate) but only few of them survive physically. And the ones which do would be wondering if it was worth all the effort being a witness to all the change around them. You see the images and drawings of the Old Delhi before 1857 and feel what wonderful experiences these gates have been through. As for the present you just need to get around the old city. I started with Ajmeri Gate. When you walk down from Chawri Bazar Metro station, you are taking almost the same path as people did in Shahjanabad. Though you have to get around the now barricaded gate rather than through it. The once famous Delhi college is just opposite gate but the guard did not allow me inside even to take a photograph. 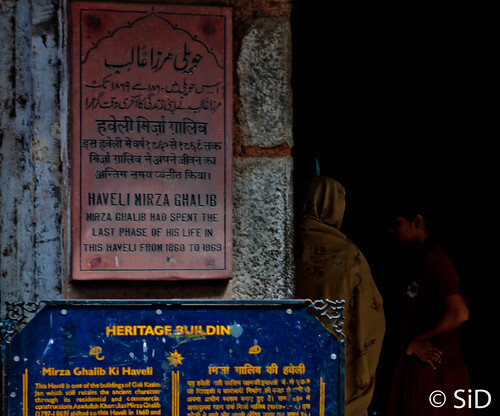 Mirza Ghalib, some hundred and fifty years ago, too had stood here after being invited to be a persian professor. 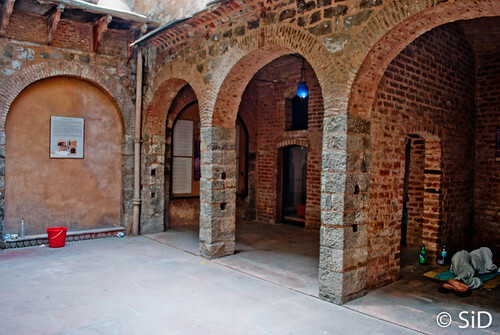 He expected the secretary to come and formally welcome him inside but that did not happen and Ghalib – his ego hurt, never taught at the college. Moving east along the imaginary wall of the city, you come to the Turkman Gate. Overshadowed by the Delhi Stock Exchange it lies forgotten on one side of the road. Though the area was filthy but inside the barricades, the Gate and its immediate surroundings were clean. Standing there and clicking the photos of this gate, I got ‘what-a-mad-guy’ looks from passers-by. You need to go further east to reach the Delhi Gate. 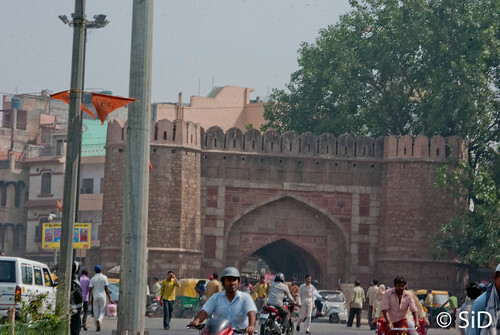 The gate which saw Mughal kings ride leisurely through it on elephants now witnesses people rushing past by its sides. The road once led to a Lunatic Asylum just outside the city. 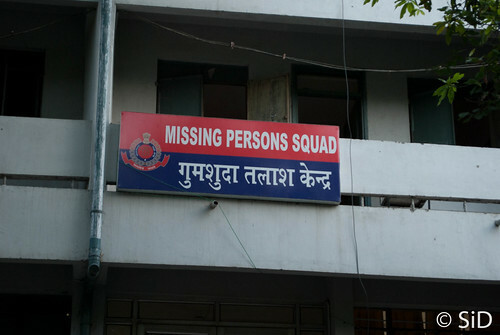 Today it leads to..well..New Delhi.